・You can form a “team” and give it your own name. 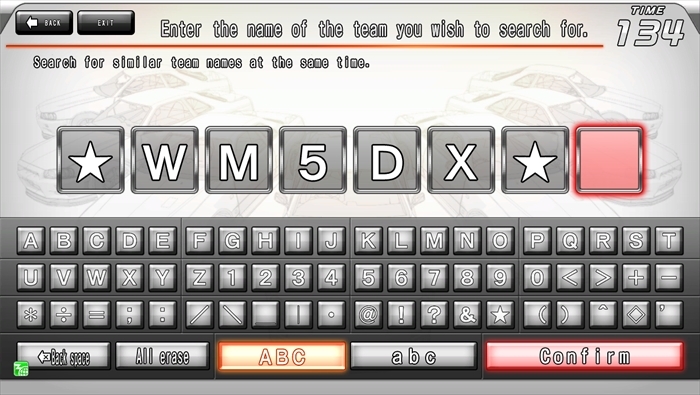 ・You can attach your own original name (English letters and numbers, up to 8 characters). ・You cannot use a name that another team is using. ・You can put a matching sticker in the windows of your cars. ・You can enter only one team per card. ・A maximum of 50 people can join a single team. You can create your own team. When starting a team yourself, choose “Create a New Team”. You can give it a name of up to 8 characters maximum. Enter the team name you have thought of and press the “Confirm” button. *You cannot use spaces in the team name. 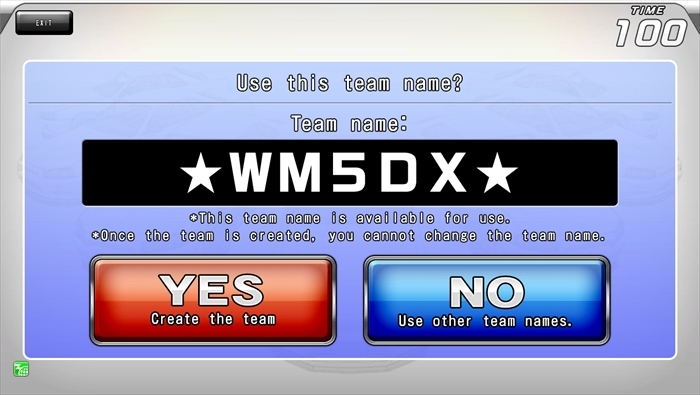 If the team name is available for use, you will be asked, “Use this team name?”. Now your team has been created. The person who started the team is the leader. Invite members to join your team! *You cannot use a team name that is being used by another team. If you enter a team name that is already in use, “This name is being used by another team” will be displayed. *There are some names that cannot be used. *You cannot change the team name once it has been created. You can apply to join an active team. To join an active team, choose “Join a Team”. ◆Enter the name of the team you wish to join and search for it. 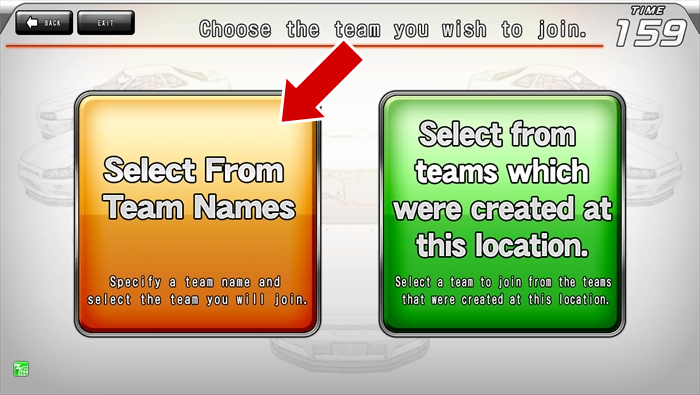 Choose “Choose by Team Name”. Search for the name of the team you want to join. Enter it correctly and touch the “Confirm” button. *Be careful not to confuse upper and lower case letters. *Team names cannot be matched by the latter parts. Enter the name from the beginning. For example, when searching for the team “MIDNIGHT”, you cannot find it by entering only “NIGHT”. ・When you see the team you want to join, touch “Apply to Join”. *If the team whose name you entered does not appear, it is possible you entered the name incorrectly, or the team has been disbanded. *Before applying to join, you can see the team’s member list. If you choose “View Member List”, information about the team’s members will be displayed. *If the team is not accepting new members, you will not be able to apply. *You can display teams with similar names to the one you entered. View them using “Teams with Similar Names” (you can apply to them). ・After you have applied to join, if the team’s leader or another member confirms your entry, you will become an official member of the team, and can put the team sticker on your car. *If your entry is refused, or not accepted within one week, your application will be canceled. ◆You can also choose a team to join that was created at the store you are in. If you choose "Select from teams which were created at this location", up to 99 teams created at that location will be displayed. You can search this way when your friends have created a team at the location you frequent. When you find the team you are looking for, touch it and check the information. 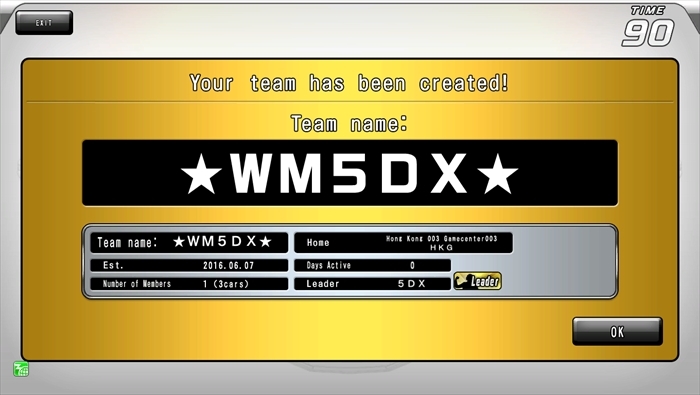 The team name, date of creation, days active, number of members and cars, and leader name will be displayed. If there is no mistake, apply to join using “Apply to Join”. 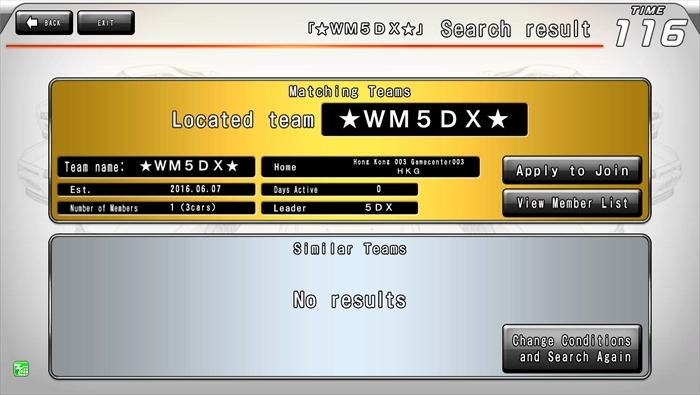 After joining a team, if you touch the “Teams” button on the Wangan Terminal you can see information about your team or change settings. You can see information about your team members. 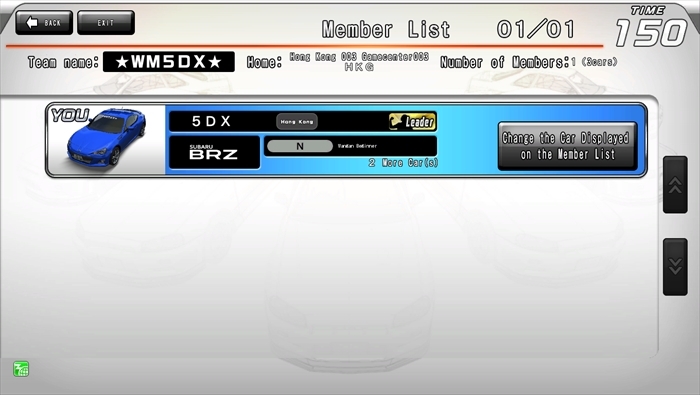 You can choose which of your cars will be displayed on the member list. You can see information about your team’s members. You can select this if there is a player who wants to join your team. 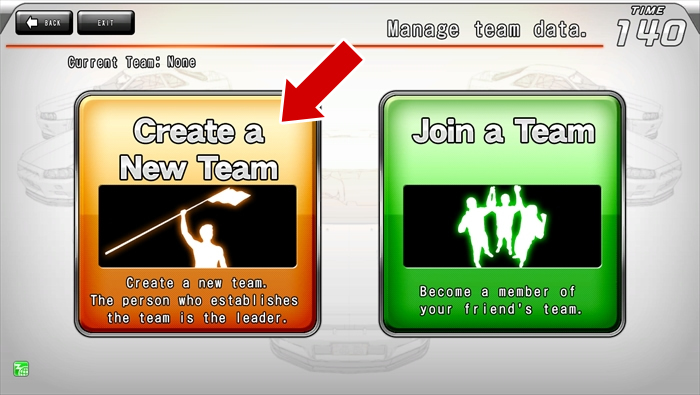 You can add the player who wants to join your team if you have not reached the limit (50 members). 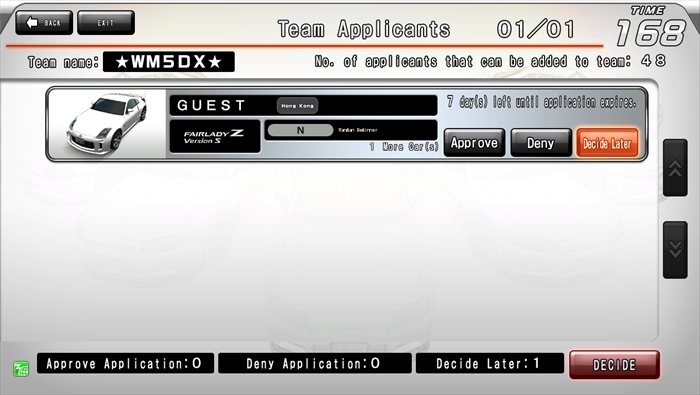 A list of applicants will be displayed, so touch to select “Approve”, “Deny”, or “Decide Later”, and then touch “Decide”. *Applicants for whom you selected “Decide Later” will be kept pending. You can choose again next time. You can check the team information. Also, you can change the following settings. Sticker font (appearance of the letters): You can choose a font you like from five types. Team member recruiting: You can set the team to accept or reject new members. You can disband your team. *The team name of a team that has been disbanded will not become available for use. *A leader who disbands their team cannot create a new team for the next 30 days. You can view information about your team’s members, the same as the leader. You can check information about the team. The screen is the same as the leader’s, but you cannot change settings (only the leader can). You can leave a team you have joined. 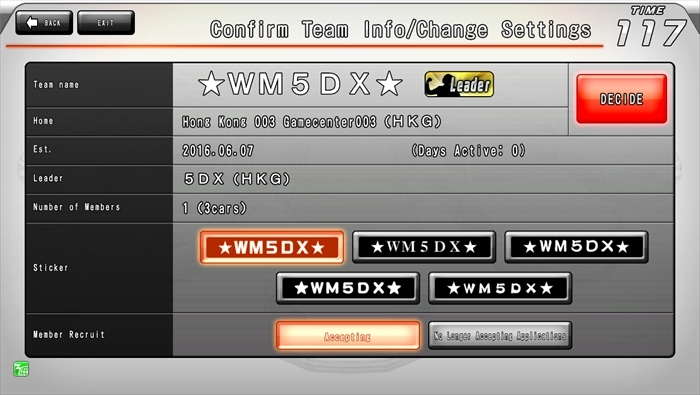 When you touch your card to a Wangan Terminal and there has been a change to your team’s information, a notification screen will be displayed. This is displayed when there has been an application from a member who wishes to join your team. You can decide whether to add the new member or not (possible for leader and all members). 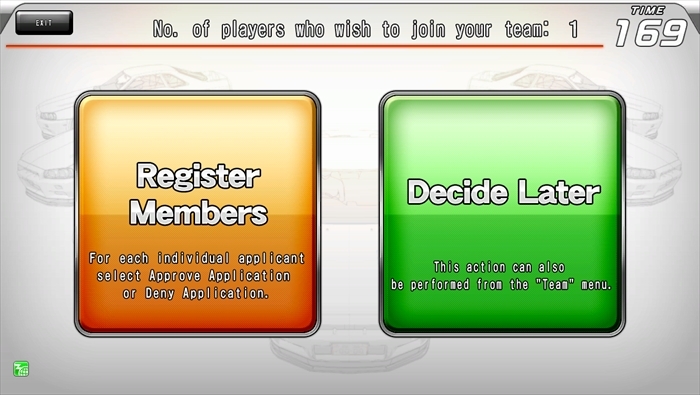 If you are the leader you can choose “Register Members” or “Decide Later”. *If you choose “Decide Later”, they will all become pending, but you can confirm them later from the Team Menu. *If you are a member, it is not “Decide Later” but “Defer All to Leader”. If you choose “Defer All to Leader”, you will leave confirmations of member applications to the leader. Members cannot do the confirmations later. If you choose “Register Members” a list of applicants will be displayed, so you can choose from “Approve”, “Deny”, or “Decide Later” (for members,“Defer All to Leader”) for each applicant. When you have made your selection for each person, touch “Decide”. If you do not select an option, it will be treated as “Decide Later” (or for members, “Defer All to Leader”). 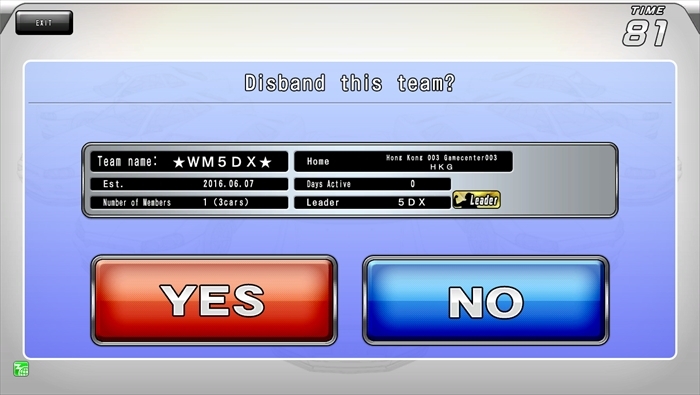 This is displayed if the team of which you are a member disbands. 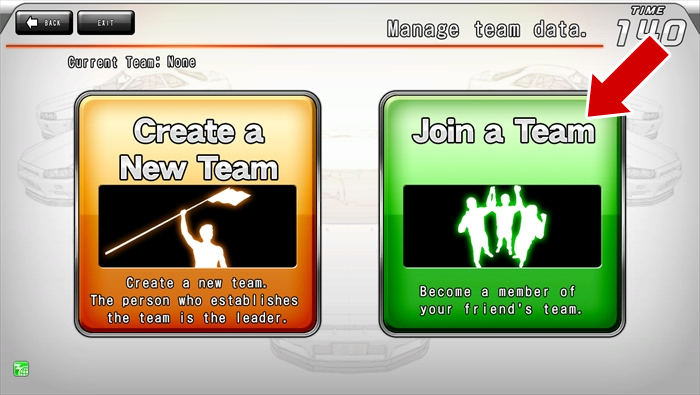 This screen is displayed to tell you when the team leader has changed. *There are some circumstances in which the leader of the team automatically changes. If the team leader has not played in 90 days, the member displayed highest on the team member list, excepting the leader, will become leader. *If, while you are managing the team from a Wangan Terminal, another member is also managing the team from another Wangan Terminal, there are times when the results of your actions may differ from what is displayed on the screen. *If a team is made with a team name that harms public order and morals, it may be disbanded without notice on the judgment of the administration.